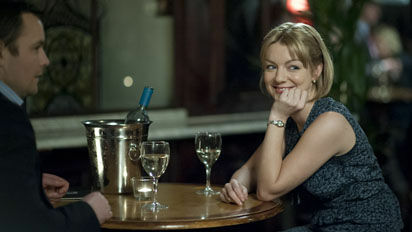 Sheridan Smith is one of the most versatile and sought-after acting talents working today. At home doing everything from theatre to TV to film, and musicals to drama to comedy, and with a clutch of awards to her name, she is one of the rising stars of her profession. Her latest project is Dates, a new nine-part series on Channel 4. Here, she talks recalls an unfortunate encounter on a bus, and remembers a lachrymose encounter with a Hollywood superstar that changed her life. You star in Channel 4’s new series, Dates. What’s it all about? It’s nine episodes, following different couples in each episode. It’s basically what it says on the tin – Dates. Nowadays we’re all going on lots of different dates – well, I say ‘we’, I’m not going on that many – but people are joining dating agencies and things like that. So it’s very current. And it’s great fun – each one’s very different, and different characters come in and out. I’m in two of the episodes, on two different dates. You play Jenny. She’s not an altogether straightforward character, is she? No, she’s a bit complex! You kind of see that as the story goes along – she has a bit of an issue to deal with. But she’s a really nice girl underneath it all, she just has this compulsion that she can’t seem to help. But in her everyday life she’s a schoolteacher, and she’s good at her job, and she’s a really nice girl, with a big heart. She goes on two very, very different dates. One’s quite dark and one’s quite amusing. Actually, they’re both very funny in their own way. Did you do any research into the role? Did you look into the world of internet dating and that sort of thing? Well, I’ve got lots of friends who have done it, so I spoke to them, really, and heard their funny stories. A couple of years ago, when I was doing Legally Blonde, a lady who worked on that behind the scenes would tell me stories about different dates she’d been on through internet dating. It was fascinating, and I told her she should write a script about it. But anyway, we’ve been beaten to it by this! But Bryan [Elsley, the series creator] has done such a brilliant job on this. It’s a great idea, there are so many different types of people out there, so many mixtures and combinations – the series could be endless, really. So I’ve got lots of mates who have got lots of really funny stories over the years. And I’ve got mates who have got married through meeting on internet dating sites, so it really can work out – even if sometimes it does go disastrously wrong. They’re real two-handers, these episodes. Who are your co-stars? The first one is with Neil Maskell, who’s an amazing actor. I’ve always wanted to work with him, I’ve had mates who have worked with him, and I’ve seen him in loads of stuff, and just thought he was brilliant. So when I heard he was in it, I was thrilled. And he was so lovely. Not like his character, put it that way! And then in my other episode, it was with Andrew Scott, who’s a friend of mine who I’ve worked with before. We did Scapegoat together a year ago, we played husband and wife in that. There’s a lot of laughter in that episode, and thank goodness, because we literally could not stop laughing. He’s the funniest man to be on set with, I had tears streaming down my face numerous times. That must be a nightmare for the make-up people. Yeah, they had to keep coming on and going “Stop making her laugh so much!” I was wiping tears away and wiping all my make up off. Actually, Neil’s hysterical too. It was just a brilliant shoot. It was a really nice job. But it was also a really quick shoot – we did every episode in three days. There was no time for messing up. Every member of the team in every department had to be on it. Bearing in mind you are playing a couple on a first date, was it easier to do that with Andrew, because he’s a good friend, or with Neil, because you didn’t know him? It was kind of perfect with Neil, because I’d just met him and I was in awe of him, so I kind of had that nervous energy around him, which worked really well. But he totally put me at ease, because I can get quite nervous. He totally looked after me, he was an absolute gem. But the nervousness of two people meeting for the first time was definitely there in that one. With Andrew, it’s a bit further down the line, and she’s been on so many dates, she’s started to give up, so she’s much more relaxed – so that kind of worked well that we knew each other and were automatically more relaxed. Have you been on any dates that have gone really badly? I feel really bad in case the person reads this, because he was a lovely guy. But we’d gone out, and he’d been drinking this kind of red cocktail, which was already a little bit disturbing, and we left this bar, and we were walking through the night, and I thought “This is going to be a bit romantic” and then he took me to the bus stop, and we got on the night bus, and there were no seats, so we were stood up, and as we’re swaying about holding on to the bar, I could see him turning slightly green. And before I knew it, I had red sick all down my dress. Unfortunately I didn’t see him again. He probably didn’t remember the next day, but if he did, he’d have been mortified. I don’t think I’ve had worse than that. Yet. What advice would you give to a girl going on a first date? Oh God, I can’t give dating advice, can I? I’m the last person who should be giving advice. Okay, what advice would you give a boy going on a date? This is so hard! Okay, be gentlemanly. Make her laugh. Put her at ease. What’s the biggest turn-off in a bloke? Being too cocky. It’s nice to be humble. I’m such a weirdo. I’m animal-mad, so my ideal date would probably be something involving going to see animals. An ex-boyfriend of mine once hired out a chimp sanctuary for me for the day – I’m mad about chimps. It was amazing, I got to see and hold the monkeys. So something like that. And it’s always nice to be swept off your feet a little bit. But my big thing is, make me laugh. You’ve been on our screens and on stage for over a decade now. What are the roles that have meant the most to you? I’ve been so lucky, I’m really grateful for the roles I’ve been able to play. They’ve all been so different. I really enjoyed doing Legally Blonde, a musical, but I’ve also really loved doing straight plays. I’m doing Shakespeare this summer, which will be another challenge. Telly-wise, I’ve enjoyed each one for different reasons – Gavin and Stacy, Benidorm, and Dates would be right up there. But if I had to choose one, it would be Mrs Biggs. We filmed in Australia for two months, which was an incredible experience. We became a little family. And it was a real life story. I became really good friends with the real Mrs Biggs. But they’ve all been special roles. And I loved getting to work with Dustin Hoffman and Dame Maggie Smith – I felt like I should be curtseying every morning on set. I was so star-struck! I can’t believe my luck, really. Dustin Hoffman first saw you on the stage in Flare Path, and then came back stage to see you. That must have been a massive highlight of your career. Oh my God. I’ll never forget it. I didn’t know he was in the theatre, thank goodness., or I’d have been too nervous. There’s a scene in the second half of the play where she is having a letter from her Polish husband, who’s away at war, translated for her – it’s a really beautiful moment in the play – and after the play, Dustin Hoffman came backstage and he was crying. He said something lovely, which I won’t say, because it makes me embarrassed, and then I started crying, and when he left, I rang my mum, and I was crying for about 20 minutes on the phone to her. Then a couple of weeks later he got back in touch and said he wanted to put me in his movie, which was just beyond my wildest dreams. The last year or two have been phenomenally successful for you. How do you feel your life has changed in that time? I just feel so paranoid that it’s all going to end tomorrow. I always think I’ll get found out. Because I didn’t train, I always have this fear in my belly that I’m rubbish and suddenly everyone’s going to realise. So I treat every job as my last, really. I haven’t really thought about things changing. I’ve realised I’ve been a bit more busy than I used to be, and that I’ve had to say no to some jobs, which I don’t like to do because I’m so honoured that they’d want me. There are so many brilliant actors out there, so to be working and getting paid for doing what I love, I can’t be any more thankful for that. But it could all end tomorrow, so I’m just grateful for what I’ve had. Is it difficult dealing with the attention? I don’t get that much attention really. That’s the only thing that’s changed slightly. If I go for a drink with one of my gay mates, they’ll say that I’m dating him. We find it hysterical. But I’ve not had anything nasty, people have only been nice. It’s the same on Twitter – which I’m obsessed with – they’re like my little cyber-family. And, to be honest, one of the things I love about theatre is that you get to meet people at the stage door, whereas when you’re filming, you never know what people’s opinions are. At the theatre, you get people’s live reactions, and you get to chat to them afterwards. So no, I don’t mind that side to it at all. In the end, you only do what you do because you want people to like your work, so hearing that is really nice. I don’t know. I’ve been asked that a lot recently. I never know what to say. I don’t think too far ahead – that way you can disappoint yourself. Be grateful for what you’re doing, treat every job like it’s your last, give it 110 per cent, and anything else is a bonus.